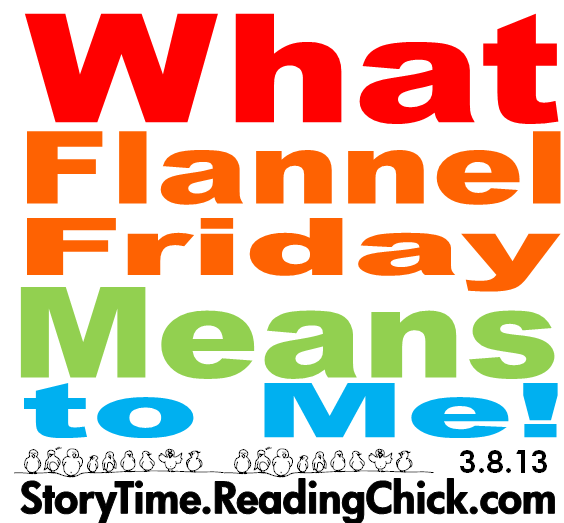 For the two year anniversary of Flannel Friday, Sharon at Rain Makes Applesauce is doing a special roundup of posts where community members reflect on how FF has impacted them. For me, Flannel Friday was the beginning of creating a personal learning network (PLN) that has dramatically changed my career for the better. When FF started I was alone at a rural library with a too-big job and no network whatsoever. It was sad. And lonely. Through Flannel Friday I got onto Twitter--FF gave me an entry point, people to follow, and reason to be on Twitter. Now I have a worldwide network of amazing librarian colleagues, many of whom have become real life friends, and that has led me into participating in librarianship on a wider scale by giving me the resources, awareness, and connections needed to get involved with presenting and committee work. I love the idea sharing that takes place on FF. My first post included no flannel; it was a prop story. I continue to advocate for FF as a community for idea sharing rather than one specific format. It's so much more than just flannel board stories! To me, Flannel Friday means community. Ditto what Amy said. You crack me up. Anna, you're the best. I love the concept of an "entry point" and was talking about this with Amy earlier today. Go you for building FF into a scaffold that supports YOUR career in YOUR way. That's something I hope all FFers can make happen! You've got it spot on, Anna. There are so many benefits to be gained from following Flannel Friday, but it's the sense of belonging and community that draws us all together. I'm pretty new here, but I can imagine that it will become an even richer experience as I get to know people better :-) Thanks for sharing!